As we transition into summer, I’d like to take a moment to thank all of you amazing judges for enjoying our newsletter, as well as those of you who’ve submitted images for the Sugar On Top section. 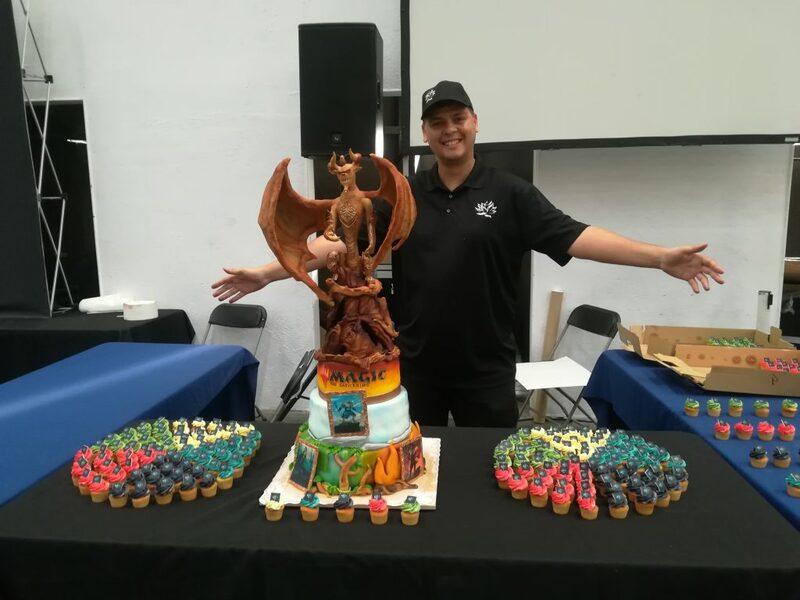 We’ve gotten more images submitted that we can feature this month, and it shows what an great community and cool things we can see at events. So take a look at wave 13 exemplars- we have judges doing good work, I’m personally glad to see it featured. Be aware of some of the policy changes upcoming with M19 (especially in the near future with team policy), and the recent changes of Proxies. 601.3a has been updated. This changes the answer to whether or not you can cast Squee from under Ixalan’s Binding. Everyone’s favorite immortal goblin is no longer strong enough to break his shackles and the Plane of Ixalan keeps him stuck in the treasure filled sands. For a less colorful and more detailed explanation, head over to this forum post. Exemplars for Wave 14 are open! Submit your exemplar today! Remember that there’s also an update from the wave 13 release in the Community section. Some updates for you from the Judge Apps development team. You may have noticed you need to verify your email, and there’s some security updates too! Congratulations to all of the judges who celebrated an anniversary in June 2018, including Peter Jahn , QJ Wong , Casey Brefka , Josh Stansfield , Bryan Prillaman , and Jason Wong ! Welcome to the Fold: A big welcome to the following judges who worked their first GP in 2018! Wave 13 is now live! Read about the updates, and check out who got recognition on Judge apps! Don’t forget to nominate an awesome judge in the recently opened Wave 14! The Third and continued portion of How to handle feedback in real life! More thoughts to consider on what feedback means in the program. You can find the first two portions of the article at The Coaching Sphere blog page. 1. AP gains control of NAP’s Darigaaz Reincarnated with an Hijack. It dies during this turn and AP exiles it with 3 egg counters on it. Who will controls its upkeep triggers? 2. In a game of Commander, player A convinces player B to Assist him casting Huddle Up. B taps a couple lands to assist A and at this point A renegades, choosing not to pay the remaining mana. At this point, Huddle Up gets backed up and B has 2 mana in his mana pool, until this phase or step ends. Is this correct? A: “The rules for casting spells (CR 601) describe what happens if a player is unable to finish casting a spell, say because they’re unable to pay its costs: the casting of the spell is illegal, and the game returns to the moment before the casting of that spell was proposed. This means that not only will the spell be back in its owner’s hand, but the mana abilities Player B activated will also be undone. Player B’s lands will be untapped, and they will have no mana floating.” A DQ for Cheating could be considered, as this interaction is very similar with the Goblin Test Pilot + Suppression Field. 3. NAP controls Lantern of Insight. With an Island on top of his library, AP resolves Sleight of Hand. Does NAP know where the Island goes to? A: “Lantern of Insight doesn’t change anything about how Sleight of Hand works – NAP is not entitled to know which of the two cards AP puts into their hand, regardless of whether or not the top card of the library happens to be revealed at the time. 4. AP controls two Bramblewood Paragon and one Primal Vigor. If he casts a Warrior creature spell, can he choose to apply first the replacement effect of one Bramblewood Paragon, then the Primal Vigor and then the other Paragon? If so, with how many counters will the Warrior enters the battlefield? A: “Once the first Bramblewood Paragon has been applied and both of the remaining effects are applicable, the player may choose to apply whichever one they prefer, and then the remaining one will be applied afterwards. If they want to apply the effects in that order, they can do so. This month’s article is actually a tournament report summing up the experiences judging on the deck checks team for both days of an SCG Open. You can check it out here. We are happy to share with you the second article from the Planar Bridge Project covering what happened during April and May in terms of the meetings organized at eight different GPs. Find out which Judge Conferences, Grand Prix and SCG Opens have available worldwide staffing positions! 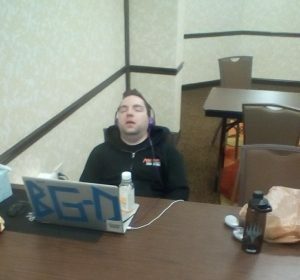 You still have some time to apply for SCG Open Dallas and SCG Open Baltimore! If you prefer Scorekeeping, you can also apply for Grand Prix that take place between October and December! Public Projects such as Judge Booth and Player Surveys are looking for awesome judges who can help! If you wish to get more out of your Judging experience and give back to the community, sign up for something that interests you! We have had some great submissions from the judge community this month, so we’ve decided to feature not one, but TWO images (and if you paid attention, there’s a third image within the article)! 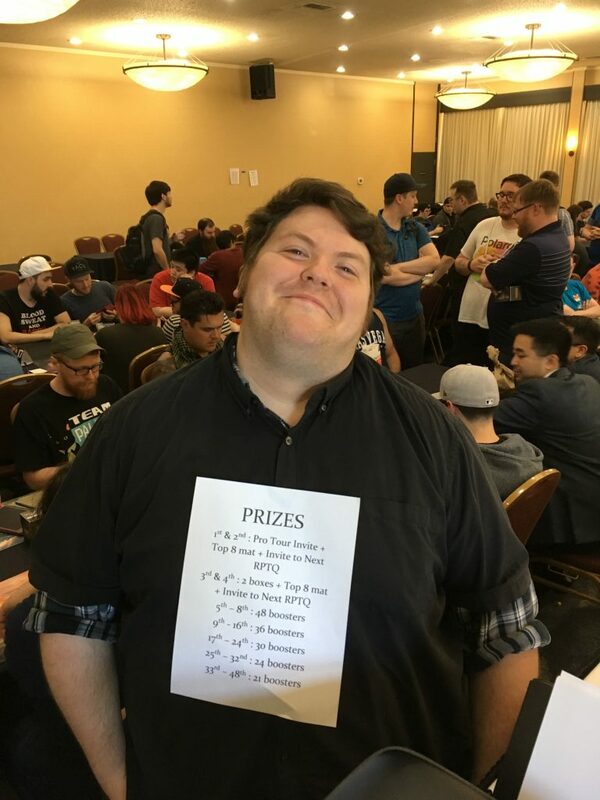 First up, is a shoutout to RPTQ winning (his whole team is heading to the Pro Tour, congrats also to L2 Steven Boston), L2 Jon Munck , who volunteered to be a prizing board at the event! Second, since it’s been such an amazing year, a gorgeous cake (yes, more cake!) from GP Barcelona 2018!